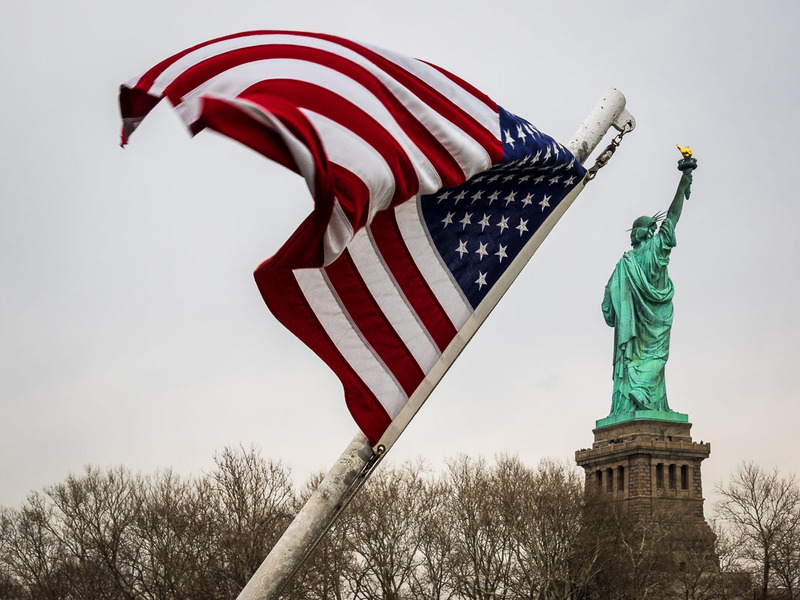 The most iconic monument in New York City is doubtless Lady Liberty, the most famous statue of the world, guarding the entrance to New York harbor since 1886. 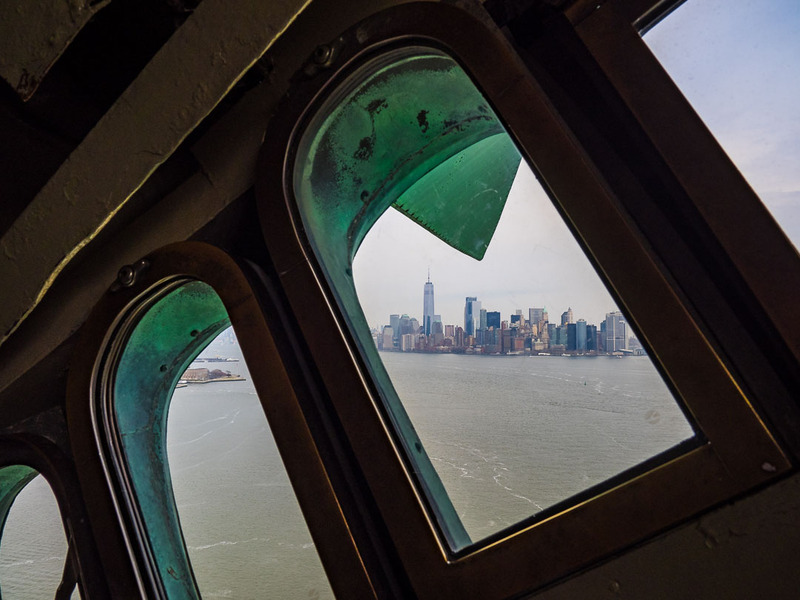 For a bit more history about the Statue of Liberty, info about our visit and more photographs, continue after the jump…. 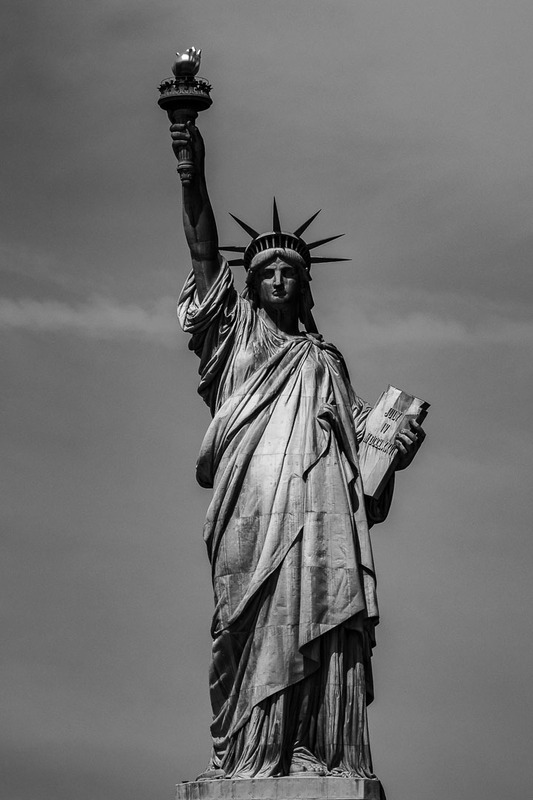 The official name of the statue, a gift from the people of France to the people of the United States to commemorate the independence of the US, is “Liberty Enlightening the World”. The colossal, neoclassical copper statue was designed by by French sculptor Frédéric Auguste Bartholdi and built by Gustave Eiffel, the father of the Paris Eiffel Tower. The statue was dedicated on October 28, 1886. 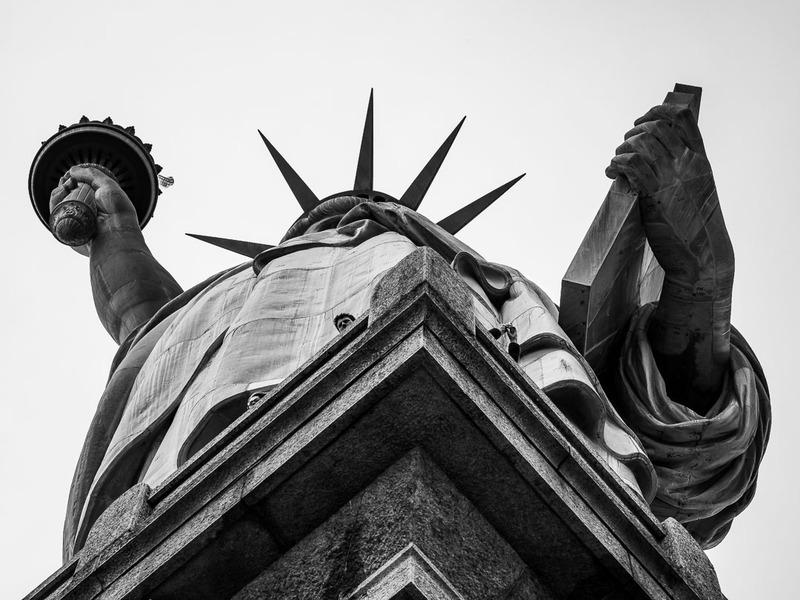 Lady Liberty, as the statue is affectionately called, represents the Roman liberty goddess Libertas. 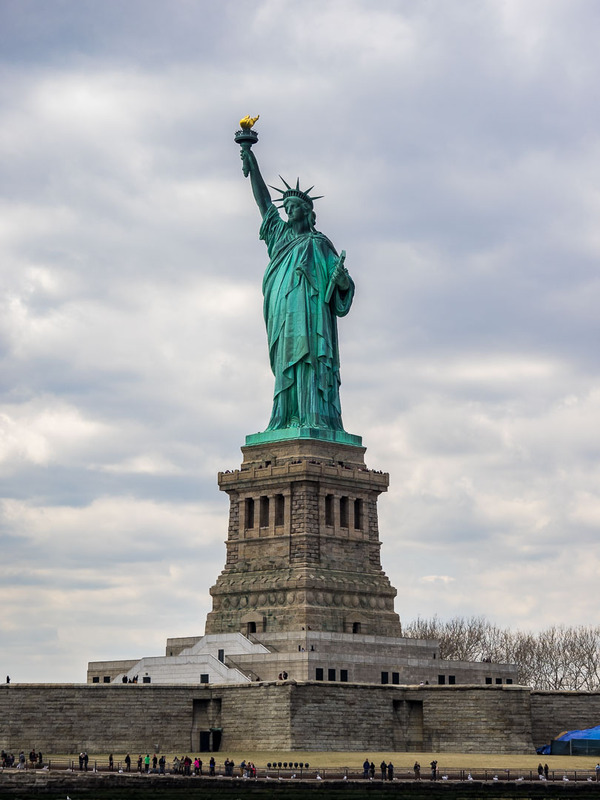 The torch she holds high above her head with her right hand, was a welcoming sight to thousands of immigrants arriving from abroad on board of ships, their immigrations processed on neighboring Ellis Island. 27 tons of copper were used on top of a load bearing steel skeleton of 113 tons. The parts of the statue were built in France, shipped to the US and finally assembled, once the construction of the pedestal was complete. Major renovations took place between 1984 and 1986. As we wanted to visit the crown of the statue (we did so already during an earlier visit in the early 90’s), The Significant Other reserved our tickets already back in February with Statue Cruises. Since reopening of the Statue after the closure in the wake of the 9/11 terror attacks on the World Trade Center, only a very limited amount of visitors are allowed to climb the 393 steps up to the crown each day. Pre-registration is mandatory. Cost is moderate, only 3 USD on top of the 18.50 USD per person for the ferry ride and visits to Liberty- and Ellis Islands. You get an assigned ascent time by which you have to clear the security screening. A perk is that the crown access tickets give you also access to the fast lane at the security center prior to boarding the ferry. Prior to entering the pedestal and the statue, you have to lock up your bags in a locker. Only camera, cell phone and a water bottle are allowed for the climb up the narrow stairs. The climb itself is not all that difficult. 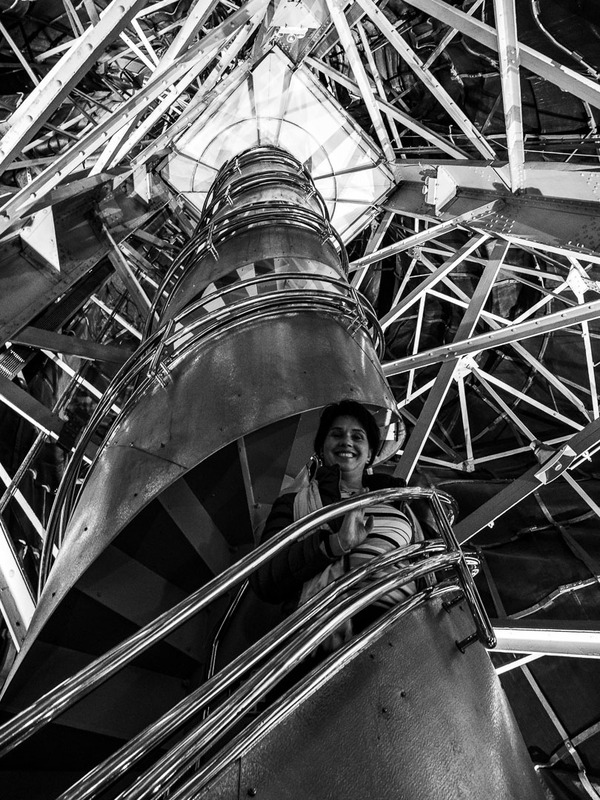 The spiral staircase is a double helix, so the people climbing up won’t meet the visitors coming down. Seeing the construction of the copper sculpture from the inside is really fascinating. When we reached the crown, the two of us were alone with a pair of park rangers, and we had plenty time to take in the sights and ask questions to the rangers. In the pedestal is also a museum about history and construction of the statue. 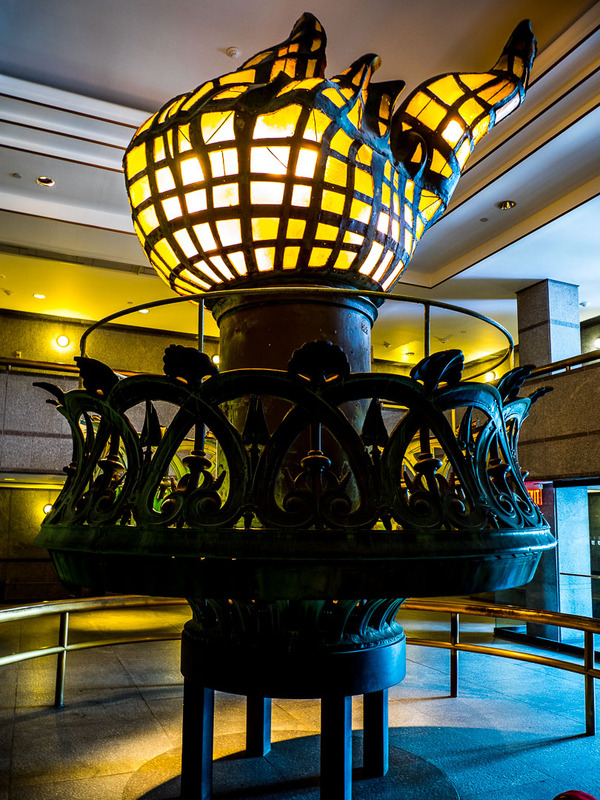 Highlight is the original torch, the Fire of Liberty greeting New York’s visitors and citizens until its replacement in 1984. After descending from the crown, there is plenty of time walking around the pedestal and the base of the statue, before taking the boat over to Ellis Island and the historic immigration facilities, but that is for another post. All photos were taken with the Olympus OM-D E-M1 and the mZuiko 12-100mm F/4 Pro Zoom. RAW conversion and post processing in Lightroom Classic CC. lOve these images of SOL. I have never come across such pictures, before, Marcus! Nice report!! Great images too. It will be almost 40 years since I came to New York during the Christmas period. I came to the island of the statue of liberty of course, but once at the top I was a little disappointed with the world there were and windows (at that time very dirty). So I could not see much. But the rest of the trip was an excellent memory. If God gives me life long enough and gives me the means to retouch, it will be an obvious pleasure for me. OH MY. What a fantastic post, Marcus! I love your images. And what a treat to get to climb the Statue of Liberty with you! It was still closed when I last visited, so you’ve (virtually) fulfilled one of my New York dreams. Thank you! Lovely photos Marcus, we also visited the crown on our visit and enjoyed the trip. Thanks so much for sharing this story! I imagine how hot it is in the statue in summer. My first time I climbed it in 10 degrees Fahrenheit in winter. It was so cold, the mirror of my analog SLR back then refused to work. Great perspectives on the Lady Liberty! Great photos and an interesting post! Thanks for this great post! I have never climbed up there because of the long lines, but knowing about pre-registration is good. Maybe one of these days. We went a few years ago, my first time even though I live in Philly. We didn’t do the crown, but the statue is awe-inspiring! I didn’t know that there is “platform” in a crown from where you can look at New York. Thank you very much for that detail. And of course Great Photos Man!